The GT Contact (GTC) is best known for our waterproof related connectors like Ethernet, Circular, USB, Sensor and Power connector as well. The reason why we produce the waterproof products in such wide range is because we are confident in the quality and design capability. This waterproof USB connector is applied to signal usage of PV inverter, outdoor LED display, marine, automation machine and IPC/Military NB. 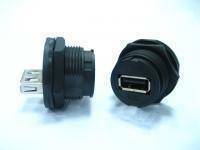 With such wide applications of the connector, the durability is also one of the key points we focus. Except for the fine quality materials, we also have tested our metal products in a 1M depth water environment for 24 hour to make sure its durability to water. If you are interested in our product, please feel free and contact with us for our fine quality waterproof USB connector today! Dielectric Withstanding Voltage 500 V DC/AC peak, contact-to-contact, for 1 minute. 750 V DC/AC peak, contact-to-test panel or contact-to-shield for 1 minute. Contact Resistance 30mΩ at 10mA Max. Durability 1,500 cycles insertion/extraction cycles at a maximum rate of 200cycles per hour.